Mitt Romney intensified his efforts Monday to draw a sharp contrast with President Obama on national security in the presidential campaign�s closing stages, portraying Mr. Obama as having mishandled the tumult in the Arab world and having left the nation exposed to a terrorist attack in Libya. In a speech he gave at the Virginia Military Institute, Mr. Romney declared that �hope is not a strategy� for dealing with the rise of Islamist governments in the Middle East or an Iran racing toward the capability to build a nuclear weapon, according to excerpts released by his campaign. But beyond his critique of Mr. Obama as failing to project American strength abroad, Mr. Romney has yet to fill in many of the details of how he would conduct policy toward the rest of the world, or to resolve deep ideological rifts within the Republican Party and his own foreign policy team. It is a disparate and politely fractious team of advisers that includes warring tribes of neoconservatives, traditional strong-defense conservatives and a band of self-described �realists� who believe there are limits to the degree the United States can impose its will. Each group is vying to shape Mr. Romney�s views, usually through policy papers that many of the advisers wonder if he is reading. Indeed, in a campaign that has been so intensely focused on economic issues, some of these advisers, in interviews over the past two weeks in which most insisted on anonymity, say they have engaged with him so little on issues of national security that they are uncertain what camp he would fall into, and are uncertain themselves about how he would govern. In his remarks, Mr. Romney addressed the Palestinian issue, saying, �I will recommit America to the goal of a democratic, prosperous Palestinian state living side by side in peace and security with the Jewish state of Israel.� And he faulted Mr. Obama for failing to deliver on that front. But while the theme Mr. Romney hit the hardest in his speech at V.M.I. � that the Obama era has been one marked by �weakness� and the abandonment of allies � has political appeal, the specific descriptions of what Mr. Romney would do, on issues like drawing red lines for Iran�s nuclear program and threatening to cut off military aid to difficult allies like Pakistan or Egypt if they veer away from American interests, sound at times quite close to Mr. Obama�s approach. And the speech appeared to glide past positions Mr. Romney himself took more than a year ago, when he voiced opposition to expanding the intervention in Libya to hunt down Col. Muammar el-Qaddafi with what he termed insufficient resources. He called it �mission creep and mission muddle,� though within months Mr. Qaddafi was gone. And last spring, Mr. Romney was caught on tape telling donors he believed there was �just no way� a two-state solution to the Israeli-Palestinian conflict could work. Mr. Romney�s Monday speech called vaguely for support of Libya�s �efforts to forge a lasting government� and to pursue the �terrorists who attacked our consulate in Benghazi and killed Americans.� And he said he would �recommit America to the goal of a democratic, prosperous Palestinian state living side by side in peace and security� with Israel. But he did not say what resources he would devote to those tasks. The shifts, a half dozen of Mr. Romney�s advisers said in interviews, partly reflect the fact that the candidate himself has not deeply engaged in these issues for most of the campaign, certainly not with the enthusiasm, and instincts, he has on domestic economic issues. But they also represent continuing divisions. Some are on the way to resolution. Over the summer, an �inner circle� of foreign policy advisers emerged, with Richard S. Williamson, a former Reagan administration official who briefly returned to government to serve President George W. Bush, playing a leading role. Another central player is Mitchell B. Reiss, the president of Washington College in Maryland and a veteran of Mr. Romney�s 2008 campaign. And Jim Talent, the former Missouri senator, has taken a major role in defense strategy. I do get weary of the Republicans saying Obama is weak - any idiot can push a button and declare a war - it takes so much more to negotiate and/or work with different countries. 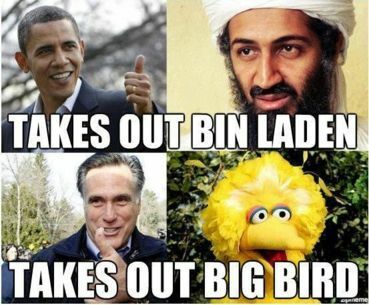 Mitt is a hawk and all those he represents are hawks - war means money for them. Obama is so much more likely to be thinking of the ravages of war, especially the people who are sacrificing career, family and even life. noted, thank you Kit. photo is spot on!!! This dichotomy of violence = strength, but diplomacy = weakness is absurd. Diplomacy and political action should be the first means of resolving crisis. The violence of war should be the absolute last. However, even if we apply the toxic dichotomy to assess Obama's presidency, then he can hardly be called weak. Since taking office he has used several times more predator drone missiles to "take out" designated "enemies" than his predecessor. These weapons are quite strong and typically "collateral damage" i.e. civilian casualties are quite high. If war is the standard by which our barbarous nation will define strength, then Obama is much stronger than the right-wingers give him credit. The problem, however, is not with the President, nor the political mudslinging that is unusually virulent this season. The problem is a nation whose people are still committed to bullying the rest of the world. The problem is a nation committed to violence whenever and wherever it sees fit. We don't need any more strong men to unleash hell upon tribesmen and their families. Anyone who sees war as a sign of strength probably has never smelled the aroma of villages burning. Are we a great nation because of all the children that our bombs and missiles murder each and every day? I think not. We need people,women and men, who are compassionate, gentle, even sensitive to lead our nation to a better way of living in this world. Americans find it far too easy to kill. We need to learn how to care. You cannot currently send a star to Carol because you have done so within the last week. You cannot currently send a star to Brian because you have done so within the last week. Speeches and comments by a candidate during the campaign seem to be done for sound bites. I did listen to this speech in full, again Romney failed to say much of substance. He calls Obama weak and ineffectual, he says he will be strong and take our country in the right direction. The Right direction? Brian, your comments are note worthy, you have stated it well. Thank you. I'm very afraid of what Mitten's foreign policy would be - should it come to that - and I sincerely hope it does not. He certainly didn't do well when he was abroad earlier this year, did he? Reading between the lines I think what I'm hearing is the accusation the of 'apology tour' that Obama didn't make without actually calling it that. And it gets curiouser & curiouser how they've avoiding all things Bush, he's become the invisible, or maybe it's missing president during much of the GOP campaign of late. Brian, excellent comments, very well put. I wish I could be as eloquent! Brian M. for president! - Romney for president of the Mormon church- if he insists of being president..
Whatever Romney says is of little substance - I agree, Kit. All he has said so far, has really been a vague set of words that attempt to 'sound good' without giving any information, whatsoever, that tells us what he would actually do. Brian, you are SO concise and right-on! I wish I could Brian, very good comment. Hooray for Brian!...Yes, very well put. It seems that because Obama does not act like a chest pounding Neanderthal, that he is weak? I am so tired of that old record playing.The definition of insanity is "repeating the same behavior and expecting different results." I thought it was my imagination but apparently others can see the superimposed image of Bush also. I am tired of Gov. Romney's change of tune whenever he reaches opposition. I also think Brian is right-on. Brian also said: "The problem is a nation whose people are still committed to bullying the rest of the world." Kind of like a young Mitt did when he didn't like the long hair of a classmate. He simply had his friends hold the young man down as he took it upon himself to cut it, as the young man screamed, pleaded and struggled. Dozens of stars to you, Brian! Your submission is brilliant! Great post, Carrie! Oh Susanne, don't worry about it, it really is not a big deal. Thanks for an excellent comment. I cannot send Kit a star yet again. Noted posts with much interest. TY Kit. Brian. you deserve the recognition for a well spoken comment. Take a bow, we are all applauding you.